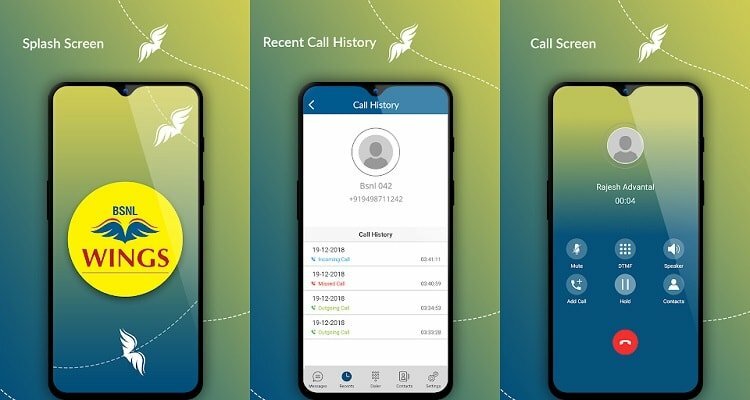 BSNL Launched the first VoIP based call service last year and till now, it was working with the help of third party SIP application mainly Grandstream Waves, Zoiper, CSIP etc. Now the state run telecom company launched their own application for the Wings service. If you already used the 3rd party SIP application, then you may know that the configuration will take some steps, where as in the case of Wings application, it is pretty simple. Once open the application, you need to set the language (English or Hindi). Then you can login to the application either using the QR code, that you received during the registration of Wings service or using the wings number and password. Login using Wings number and password is the easiest way which will take only few seconds. Once logged in there is no more configuration needed. The service will be registered within seconds (if the internet is working with wings). The application is simple and with only few settings. There is also option to enable the International Roaming Server or Proxy within the application. BSNL already launched International Roaming for the Wings subscribers, however the service was not working for many people since no one know the working international server address. The local server/proxy provided by BSNL was not connecting from outside country. Now, the Wings application have the dedicated International roaming domain/server/proxy within. User can switch to that if they activated the ISD/IR service by paying Rs. 2000 as security deposit. Alternatively, you can add the ‘ir’ before the local server address provided by bsnl. For example, if you are a BSNL Wings Kerala subscriber, the server address you have is ‘kl.voip.ims.bsnl.in’. Now, for international roaming you can change it to ‘ir.kl.voip.ims.bsnl.in’. Considering about the features of the application, we have to look into the problems related to the application also. The application was released just recently only and there are bugs too. Even though the call clarity of the service and the application is good, we experienced call drops when the internet speed went down. Another main issue noted with this application, is the notification. The service register and unregistered notification is popping up frequently. It is bit irritating and we may need to forcefully turn off the notification for the application. Another issue with Wings (not the app issue) is that, since the service is meant for using in WiFi and any other mobile data. Unfortunately, Wings service is not working in all Wifi network. We reported this issue with BSNL and looking for a solution. As the application is in the initial stage, we think BSNL will fix those issues at the earliest to make it better.